Motorola’s Moto X might have fallen short of becoming the record breaking sales hit the company had hoped for, but the Google subsidiary is ready to give it another go with a lower cost model that retains many of the traits that made its more expensive sibling stand out. Announced today, the Moto G starts at $179 unlocked and out of contract for the 8GB model or $199 for 16GB, and is launching in 30 countries instead of just one. In terms of design things are basically the same with a curved back panel, a plastic ridge around the front screen, and roughly the same size body despite a slight reduction in screen size to 4.5 inch. Motorola is also keeping customization key to the product. Although Moto Maker isn’t part of the equation this time around, we’re told there are 19 customization options, including interchangeable Motorola “shells” in seven colors. There’s no SD card support or swappable battery so the removable back panel is just for cosmetic purposes. Spec-wise the Moto G has a 4.5-inch, 720p (329 PPI) LCD TFT display, a quad-core 1.2 GHz Qualcomm Snapdragon 400 processor, 1GB of RAM, a 1.3-megapixel front camera and 5-megapixel shooter on the back, a 2,070mAh battery and the aforementioned 8GB or 16GB of storage options. There’s no LTE on board, unfortunately, and given the change in screen technology there’s no Active Display either. 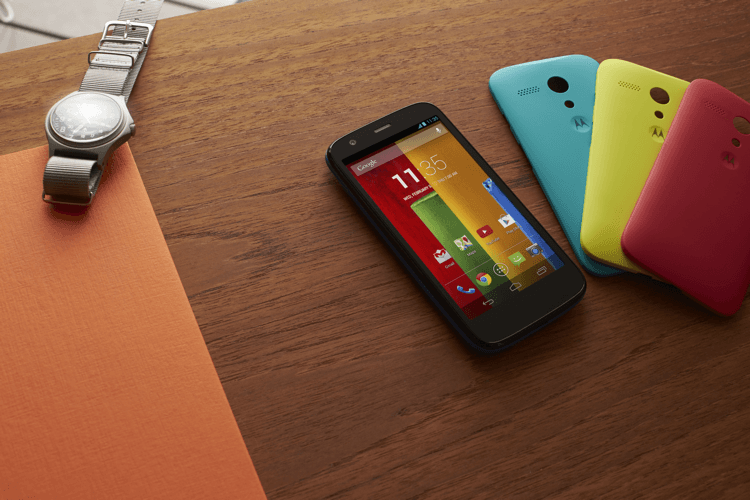 On the software side Moto G is launching with Android 4.3 Jelly Bean and the promise of an Android 4.4 KitKat upgrade in January. It’s not a "stock" Android experience but it’s close, with a few modifications to the camera software and the addition of Motorola Assist, a predictive software feature that suggests actions to automate tasks based on context -- reads messages out loud while driving, silences your phone while sleeping, and more. Unfortunately the Moto G also drops some of its sibling’s standout features such as Quick Capture and touchless voice control, since those require the special X8 processor only found in the Moto X.
It’s still a seriously impressive phone for the price tag that could easily upend the entry-level market. In fact, Motorola VP of Product Management Punit Soni claims they’ve put so much effort in optimizing the software that the Moto G outperforms the Galaxy S4 on boot time, browser launch, return home, making calls and more. Motorola says it had to go with a cost-driven approach to put the Moto G together so they opted not to produce the device in the US this time around but rather in China, Brazil and Argentina. We’re still waiting for availability details but launch markets reportedly include the UK, US, France, Germany and parts of Latin America and Asia.